As always, the urgent leaves no time for the important. Actually by Argentinian master cartoonist Quino. Left: Legendary Argentinian soccer player turned struggling Argentinian head coach Diego Armando Maradona during last week’s defeat to Brazil. 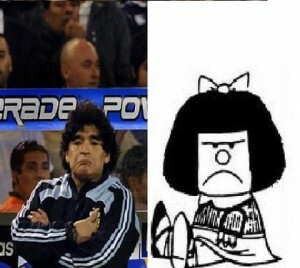 Right: Legendary Agentinian comic book character Mafalda during one of her earliest appearances.